Longines have a new and superb trio of timepieces, the Longines Avigation Oversize Crown collection, and if like me you were smitten by last year's celebratory Mono-Pusher Chronograph edition, then I think you'll also find the new models extremely pleasing on the eye. Longines describe the new pieces as "the ideal accessory for a pilot" - they're not wrong. Taking inspiration from one of their 1920's models, each new edition has white-on-black dial clarity and a fluted bezel designed not for decoration but for precision setting in both directions with a single index marking for reference setting. And that voluptuous crown.....? A safety measure so that access to the bezel, even while wearing regulation pilot's gloves is possible without nudging the crown - but despite its utilitarian origins, it does add a touch of character to this rather handsome collection, does it not? Each model has a 41mm steel case, generous open lugs, lumed indications and a compendium of shaped, gold plated hands ranging from pear to eye-lash slender forms, each of which give added charm. 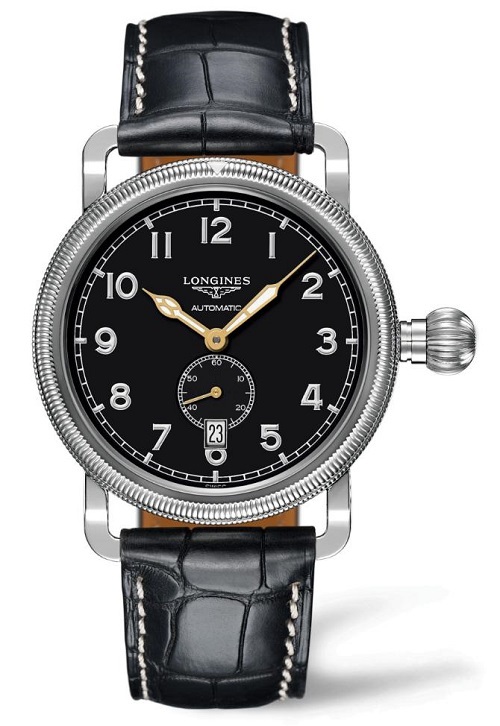 The Longines Avigation Oversize Crown is of course the plainest of the three. It features a diminutive small seconds dial and a slightly quirky date window placed atop the six o'clock. The GMT edition has a slightly busier dial, allowing for its second time zone function and it features a date window which nibbles into the 3 o'clock position. Lastly the most desirable of the three, the Longines Avigation Oversize Crown Mono-Pusher Chronograph containing the exclusive column-wheel chronograph movement, the Calibre L788 with its single push-piece operation integrated into the crown leaving no further case-side clutter. More details on these individually numbered models can be found at the official Longines website.